Thanks all, I've given them a spray with some Fairy and warm water. Slim, they sound quite nasty. i am down to one chilli after the rain as the runt drowned oops. perhaps my (last) one is not seen as fit to eat by the lurking vermin. Could I ask another chilli question please? My few seedlings are still only about 6 inches high - do I need to take the tops out at all? Ta! We have two spare plants if you want them. No need to pick the tops of. Some people like to pinch the central leader to make the plants bush. I've never bothered with that, and feel like my plants get bushy on their own. Thanks GG but I'd hate to deprive Barrie of ANY of his chillies I won't pinch them out, will just speak kindly to them. We have 10 others in the polytunnel! These are spares, clogging up the landing windowsill. 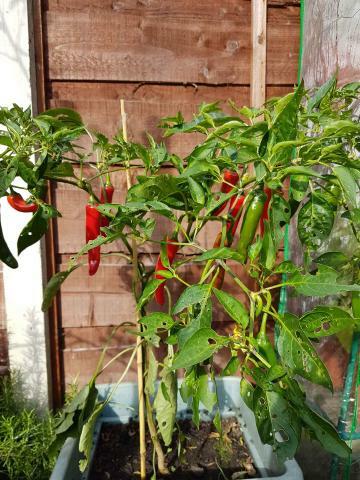 Does anyone know what these chillies might be please? They were sold to me as Carolina Reapers but they are nothing like the pictures on the internet and the heat, well let's just say it leaves a lot to be desired. The fruit itself is about 4 inches long. Thanks.